Once again diving back into Kamen Rider Kabuto, with Bandai having announced the repainted Complete Selection Modification Dark Kabuto Zecter. From what we know of it, it seems like the Dark Kabuto Zecter will be sold exclusively at the Parco Museum in Tokyo as part of some sort of Kamen Rider themed exhibition, made avalaible April 21st 2016 with a price tag of 12,960 yen. While it's cool it's been announced I find it a bit odd they went back the previous Rider season instead of doing another one after Faiz. Hard to tell if it's some kind of show exclusive or something since I can't read Japanese. Yeah I would like to know if this is the usual Premium Bandai release or a show exclusive as well. 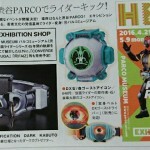 It's not mentioned as an item in the little box but it is in there with the Ishinomori Eyecon so...? If it's a Premium Bandai release like the other Zecters I might be interested. Just because the regular Kabuto Zecter is two years old and ridiculously expensive now. EDIT: Oh how nice, it's a show exclusive. Pass. You mean these wont be sold again on premium bandai? Pre-orders are up! But you'll have to wait a long time, ship date is January 2017. Check your preferred middle-man service for price and availability.